We want every race or training ride to be like a potential trip to the wind tunnel. Note: The Aero Analyzer is now part of the Race Analytics Tool set. To start our introduction we wanted to highlight the central most important factor of cycling aerodynamics, CdA. In actuality CdA is made up of two parts, Cd or Coefficient of Drag which is multiplied by A or Area. Area is just what it sounds like and is the area that the air sees as you and your bike move forward. Coefficient of Drag is a bit more complicated but you can think of it like the shape of the object. The more the object looks like a bullet versus a barn door the better it will slice through the air and the lower its Cd. When we started Best Bike Split we knew one of the most difficult aspects of the software was going to be dialing CdA for athletes' different bike setups. To get a precise number an athlete could go to the wind tunnel or the velodrome for testing, but the costs and availability associated with these limit most athletes from adopting it in mass. Through our analysis we have also seen that occasionally the numbers from these tests can be overly optimistic when performing in real world race scenarios. 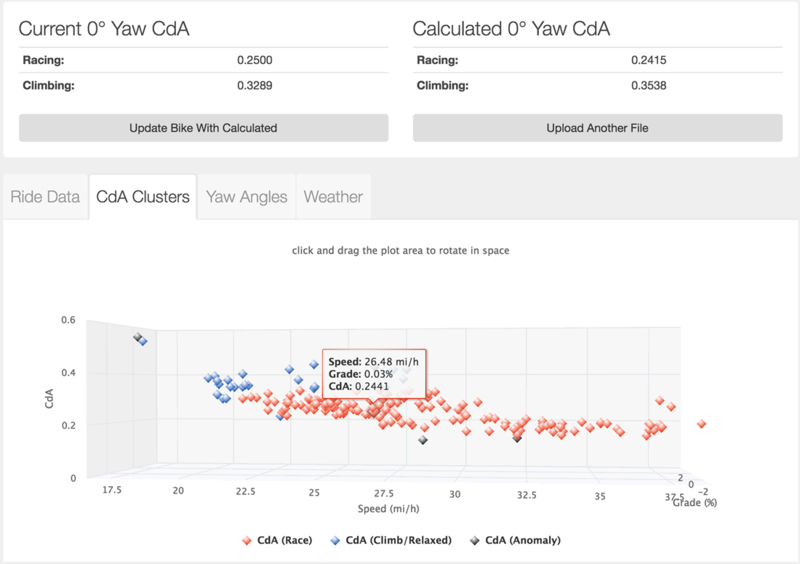 Over the last three years we have refined our methods of CdA estimation from a simple drop down menu based on riding style, to a proprietary calculator based on fit measurements, to our Time Analysis feature to try to hone in athlete settings for each new bike setup. While each of these steps helped get athletes closer, our end goal has always been to be as precise as possible giving athletes the best outcome for future time estimates, pace modeling and ultimately the race itself. To do this we want every race or training ride to be like a potential trip to the wind tunnel. Initially we thought we could run our standard pacing models in reverse and provide a good estimate of an athlete's drag given known race power. This is actually the principle used by the Time Analysis tool to estimate drag, which does work very well; however, the issue with this method is that it doesn't take into account the athlete's pacing on the race or training ride. To get a more accurate estimate we wanted to use race and training performance data to pull out the force components that impact the athlete and fill in the complete picture. How hard could it possibly be to pull out CdA from ride data? Well it turns out it is much more difficult than we imagined, and accuracy of the results is very dependent on having accurate input data. There are several known methods that attempt to solve this problem and Dr. Andrew Coggan has a good overview of these which include the Chung Method, but we wanted to start with a pure physics take on it that didn't rely on highly specified field tests. Ultimately if you know power, acceleration, speed, gradient, weight and weather conditions you can get a good estimate of drag given that you assume some tire rolling resistance coefficient. Ideally we could actually calculate both a CdA and a Crr estimate, but we'll save that for a future release. The tricky part of all of this is not only having good input data, but being able to filter out or expose bad data. For those following Lionel Sanders it was a really amazing 2016. 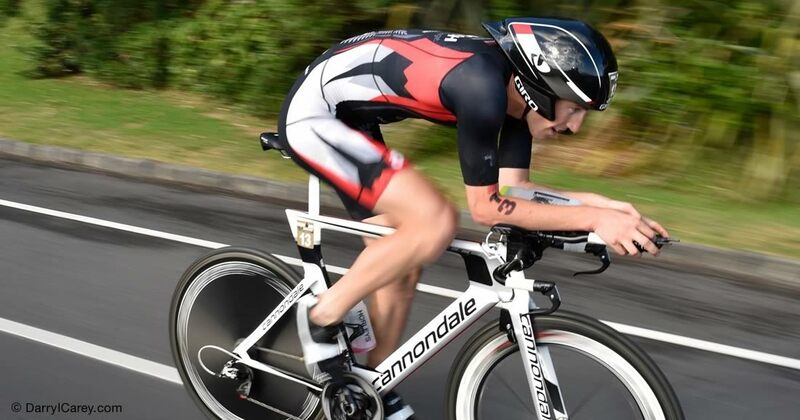 He started with an impressive streak of 70.3 wins including the Ironman 70.3 North American Pro Champs at St. George. Because Lionel has been so open with his data and with his known deficiencies in aerodynamics, he was a perfect case study when we started this process. One thing we figured out quickly was that we could not rely on data directly from a head unit. As you can see in the image the elevation from the device (light blue) and the corrected elevation (dark blue) are incredibly different and will result in some seriously skewed drag results. The key here was that speed (orange) tends to follow normal gravitational laws when there is an uphill it will typically go down and when there is a downhill it almost always go up. The corrected elevation data demonstrates this response nicely while the data off of the device does not. In our beta implementation we display both the corrected and raw elevation, but once we refine algorithms a bit more we will auto correct in more instances if the data does not align. Until then we suggest checking the data to make sure it looks realistic. One interesting note is if the CdA data going up an incline always seems overly low and the data going down seems high it could be an indication that the weight you have for your setup is higher than it actually is in real life. If you see the opposite it could be that you have the weight setting too low. In this example the data is very low on the downhill section (consistently under ~.2) and consistently high on the uphill sections despite a speed over 20 mph. This indicates the weight of the bike and rider could be lower than actual weights. In some cases we are limited by the accuracy of the outside tools to pull in data. For wind we use a service that pulls both historical and forecasted weather data based on the lat/long data and timestamps in a ride file. While this service is typically very accurate and is used by World Pro Tour teams in multiple applications, there are times when it is not accurate. I have seen this first hand during a pop-up storm in Arizona at the UHC Pro Cycling Time Trial Camp and have had odd 180-degree adjusted readings in Australia. We have added the ability to manually enter data to help alleviate these issues when known, but we can also use the calculated drag data to show any wind data that may be suspect. Where is the Good Data? Like most things you will tend to know if it's good data when you see it. I often go back to Lionel's data as he maintains amazing pacing throughout almost every single race and has done accurate velodrome testing in the past so we know where his aero potential drag point is versus the drag of his customary power position. Looking at the differences from his St. George win to his Ironman Arizona record breaking win, we can see the obvious CdA changes in the data. You can read about Lionel's approach to aero after Kona and the steps he took to implement the changes necessary to move toward his aero potential. In general the calculated Climbing CdA remained fairly consistent whereas the Racing CdA was much lower for Arizona versus St. George. 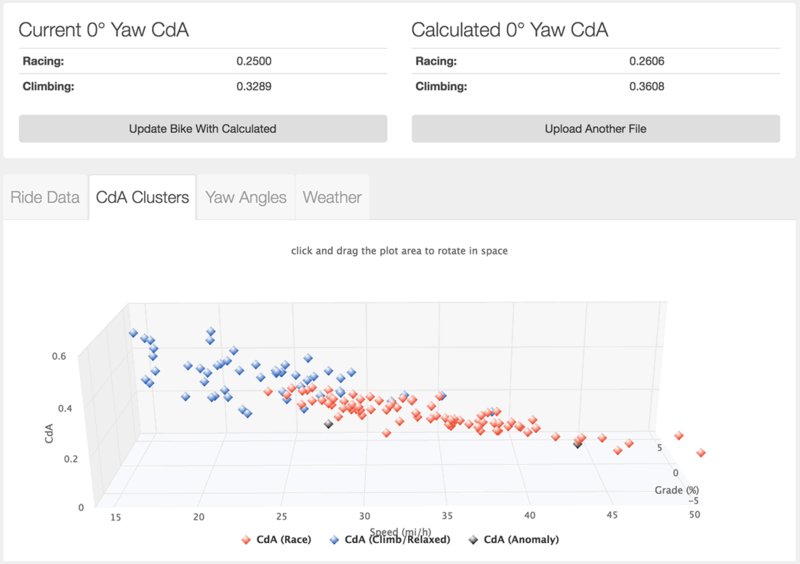 The clustering methodology we use attempts to account for the amount of climbing versus holding an aero positions. This is why there are more blue CdA dots in the St. George analysis compared to the Arizona view. The significance of this change was huge as it allowed Sanders to ride faster at lower power than previous races and left him with plenty for the run enroute to his record breaking performance. This first beta is just the initial step in a deeper level of race analysis we will implement within BBS. Over the season we will be refining our logic to automate many features so the system can help correct for data discrepancies and help estimate other variables such as rolling resistance. From there we can compare athletes' performances to their modeled potentials to give guidance on pacing performance while highlighting areas that could improve performance in the future. Ultimately we want to close the loop where the feedback from the performance can help guide the goals for future races, while providing a tool for testing positions and equipment in the real world. We have a long way to go, but this is the first major step toward getting there.